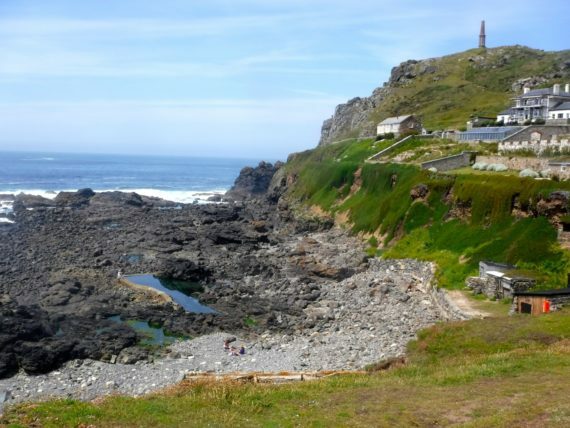 The experience of living at the very edge of the British Isles – Cape Cornwall has helped to bring together several threads of enquiry, which have been bouncing around in my mind, each fighting for supremacy. I am beginning to see now, how they all interlink. I have previously maintained that my work is about nothing more than life itself. This has worried me as I felt that this is not really a valid statement and sounds rather shallow and predictable, almost trite. But it’s not. It’s absolutely what my art is about. However, it does need further detail and evaluating. I have frequently talked about ‘Sense of Place’ without truly signifying what this means. There cannot be a sense of place without the intervention of a human presence to acknowledge this through the senses and consciousness. Merleau-Ponty goes even further stating that we are ‘the flesh of the world’. This is another way of saying, ‘being in the world’ or, at one with your surroundings. Peter Lanyon puts it that he paints ….’(the)ambiguity, between that place’s historical experience and the artists subjective phenomenological experience of it. These words came to mind when we explored the Bronze Age Village of Caen Euny and also at the deserted tin mines. Another thread of my research has been concerned with movement, with particular reference to the human figure. As Hockney has said, unless you are dead, your eyes are never still. We see everything from multiple points and it is only a camera, which can freeze that view totally. So it is apparent that not only are figures in motion, but our surroundings too, through the perspective of our eyes. Similarly it follows, that to capture our view of objects and surroundings on a two-dimensional surface is impossibility. Our attempts to do this must be supplemented by various skills and techniques to trick the eye into believing or ‘seeing’ movement. I suppose there is an element of my work, which until now, I have barely acknowledged, although it has always been embedded within me. It is a desire to capture the sublime beauty of the world we inhabit. I suspect I am not alone in a tendency, to shy away from some art movements such as the Abject, which portray not the beauty, but the misery of the World. Certainly there is extreme beauty in Cornwall, admittedly alongside the poverty, which does exist there. 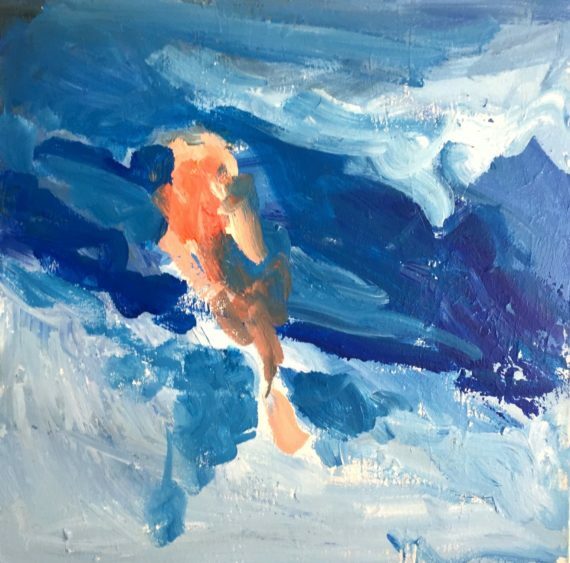 The sea is inescapable and a great source of inspiration in my work. I took video footage both in and of the sea and would like to find a way to use this in conjunction with paintings. That is going to be my next challenge and I have various ideas about how to accomplish this to express movement and human intervention within the landscape. 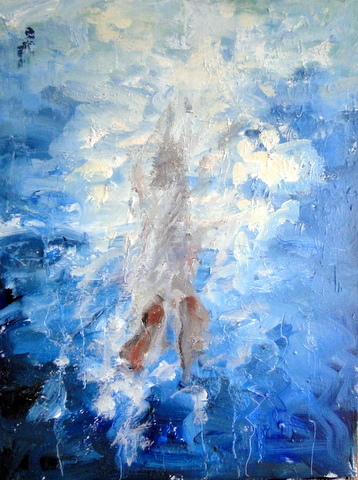 And this is a painting I made quite quickly with these thoughts in mind. It’s a start towards my final MA module. Think I may have found a direction….but I’ve said that before…hmmm. Here’s hoping.